Editor’s Note: Winter is upon us but that doesn’t mean we have to stop cycling. 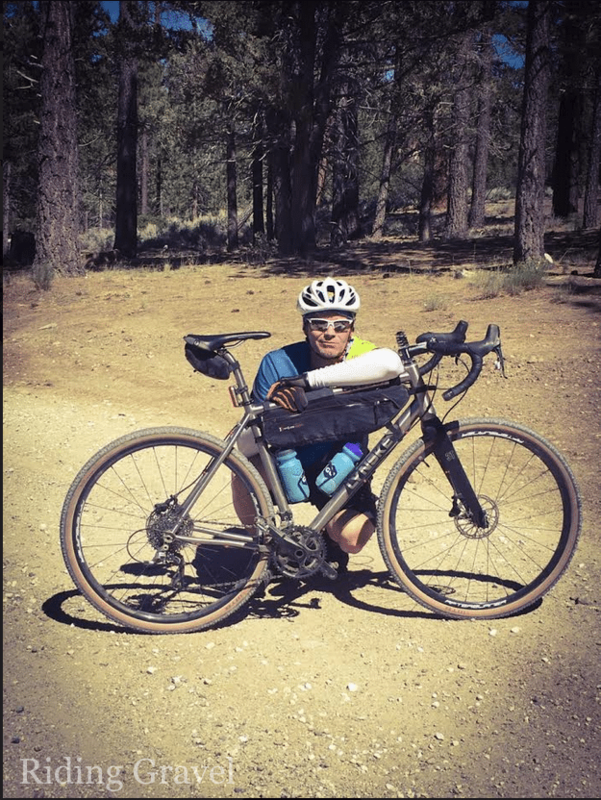 Our Riding Gravel contributors, Grannygear and MG will be giving us the lowdown on some gear we have been sent that will allow you to stay warm and meet your Winter gravel riding needs. Next up in our Winter Wear Review is another post from Grannygear. This time he wraps up his take on the Cstelli gear. 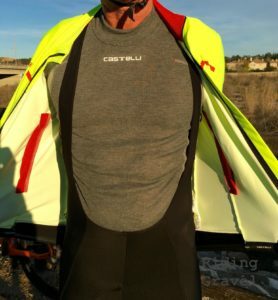 If you recall, I had been getting into some Castelli winter garments as the seasons changed into fall and winter and now it is time to report back. We had three items from Castelli: One jersey, one set of knickers, and one set of tights. Grannygear sporting the Castelli Perfetto and Sospresso gear on review here. 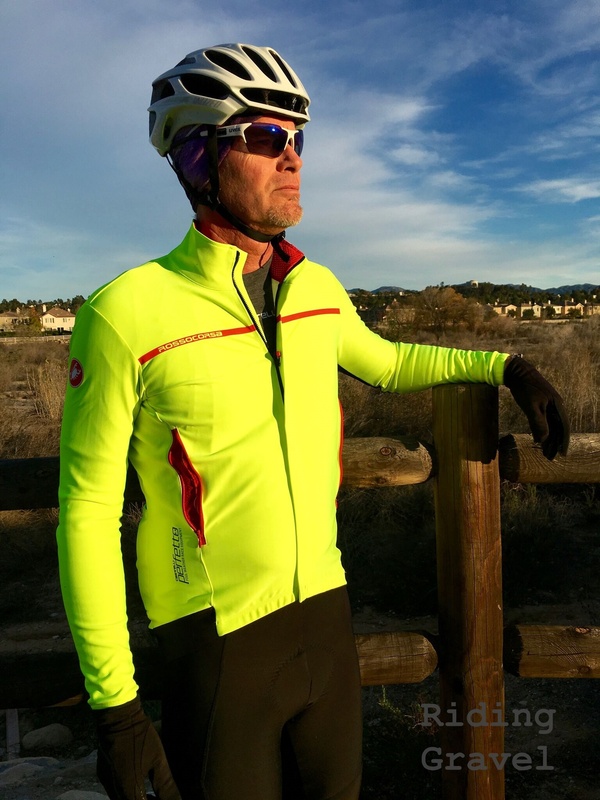 Perfetto Long Sleeve Jersey: Perfetto…Practically Perfect in Every Way. I used it in some fairly wide conditions, but mostly on high tempo rides in cool to moderately cold conditions. I typically wore it with a long sleeve base under it, but the weight of the base shirt varied from very light to fairly plush. Varying that base shirt was pretty key for getting the most out of the Perfetto. With base shirt options, I could ride in temps well down into the 40s or cracking into the 60s and be okay. Making this a reality is a three way combo of excellent breath-ability, wind fastness, and venting. Since no wind gets through, you can wear less under it and stay warm. If you do build up some sweat (and you will, of course) it will dissipate due to the excellent fabric that allows vapor to get out of there. And if you get to where that is not enough to keep from overheating, the flank zippers, in combination with the main zipper, allow you to add a good bit of air flow. You can feel that working as you ride. I stood out in a decent rain (in my front yard) and it did not let any water in, but then I took it into the shower and sprayed it with earnest. The fabric still did not leak, but the seams did. Still, I would bet that this would be quite good in light rain and brief showers, and in something like heavy fog or mist, it would be no issue at all. By using the vents and different base layers, the Perfetto can be “tuned” to varying conditions. Since the fit is so close and there is no insulation in the fabric, like a fleece backing, you do feel the coolness of the air and that can be off-putting when you first clip in and ride. But as soon as you build up some steam, that lessens. I did use it one time with a slightly heavier base then I had in my closet. Castelli sent me a Flanders long sleeved base layer in an absolutely cozy fabric blend. Not as thick as I had expected, it still was like slipping into fuzzy jammies and it further showed that you can tune the Perfetto by varying the base layer and thereby widening the temp range. 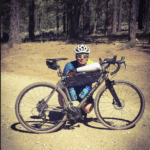 The last ride before I wrote this was a 40 mile loop that was so perfect for the Perfetto. It was likely in the mid to high 50s when I rolled out under grey skies, but soon the temps dropped little by little as headwinds began to work against me. I was working diligently to maintain 10mph over the next two hours of riding, all of it uphill on a slight grade with a couple of bigger efforts. The vents and front zip allowed me to control body temps on the hills. The headwind was chilling and the temps dropped into the low 40s as I hit the high point in the ride. But with the Castelli Flanders base under the Perfetto, I was doing really well and only just beginning to feel the cold. I added a Buff around my neck and that was enough for the moment. The return would be 25 mph for long stretches and I would not be working as hard, so I topped the Perfetto with a light rain jacket to see how if felt as a middle layer. Well I was warm then! The slim fit of the Perfetto allows you to top it with a close fitting shell. By the time I rode back to the start after a good period of lower output, there was only a trace of moisture left in the base layer. Very nice. Sorpasso 2 Tights and Bib Knickers: These have also become a key player in my wardrobe despite one big, glaring error. The shoulder straps. Apparently when you are a LG width (Size Large) in Italy, you are only 5’10” or something as the straps were sooooo tight on my 6’2” frame that they actually caused me lasting pain if I wore them several rides in a row. For days after I would shrug my shoulders and feel like I had been wearing a backpack or something, as the muscles on the tops my shoulders would be sore. I would have tossed them to a shorter person but they were so good to wear otherwise that I actually took them to a seamstress friend to add some length to the straps. The Sospresso bib tight straps were too short for the American sized Grannygear. Really, Castelli? I understand we might need to slim down a bit or go up one size to get it right, but are we supposed to get shorter as well? Now, that said, these are very nice. Although they are not windproof, they certainly buffer the wind enough to greatly reduce chill. Some tights I have worn looked thick and protective but had all the wind blocking of a screen door. The fabric also has this lovely feel to it, like it is holding body warmth. It reminds me of the difference between a typical cotton T-Shirt vs. a Merino Wool blend shirt when it is against your skin. Even if they are the same thickness, one just feels wonderful and warm. Guess which one. The fit is very snug but cut well. They speak about them having a lumbar support built in and that also makes them pretty tight across the middle at the belly. I am OK with that…barely…but if you are in the early stages of Dunlap’s Disease (where your belly has dunn’ lap’d over your belt) then these might not be the ticket. The chamois have treated me fine and are quite thick, yet not odd or bunchy. For the temps I was in, say from the low 40s to the low 60s, I was always good to go. I wore the knickers when temps were in the low to mid fifties and up and the tights when temps were below that. At The Finish: The Perfetto is at it’s best during rides where you are trying to balance warmth vs. overheating and the ride will be of moderate to high effort. If you are just noodling around, then it is still fine, but a bit wasted in my opinion. On the Sospresso tights, perhaps an XL would have given me more length in the straps, but I doubt it would be enough. Fix that issue and these would be a 10. 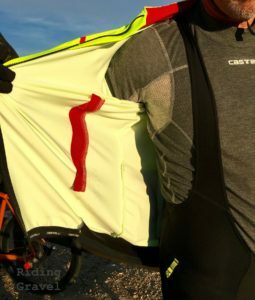 NOTE: The Castelli Sospresso Bib Tights, knickers, and Perfetto Jersey were sent to RidingGravel.com for test and review at no charge. We were not bribed nor paid for this review and we strive to give our honest thoughts and opinions throughout. I own Castelli Sorpasso Wind bib tights and concur about the short straps. They are so short that the body was pulled up into my crotch in a very uncomfortable way. I had to size up at least two sizes larger. They are for skinny people and so the legs still fit tight. Overall, sizing on this garment can only be characterized as absurd. The “Wind” version is windproof with the exception of the groin area. The newer Sorpasso II Wind wind version corrects the mistaken lack of wind protection at the crotch. Having said all that, the Sorpasso Wind tight is the only bottom I will wear below 38°f. Performance on the bike is exceptional. @TimH…Yeah, weird sizing for a product that intends to be sold around the world, so to speak. I wonder what the Danes do with Castelli? Crouch over, no doubt. I had a seamstress friend add a few inches of similar strap material into the two garments at the front and low down. That did the trick. It was either that or toss them to someone who is 5’10”. I have an older pair of Specialized SWAT bib knickers that have a wind panel in the crotch. Fabulous idea.